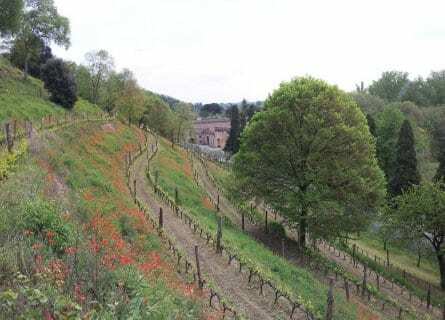 Southwest of the ancient university town of Padua (“Padova” in Italian, known for the exquisite Scrovegni Chapel, painted by Giotto), you find yourself immersed in lush vineyards. This is the scenic wine region of Colli Euganei. It is little explored and not as well known to wine tourists visiting Veneto as Prosecco or Amarone (Valpolicella) wine country, for example. The Colli Euganei is characterized by its steep, almost triangular hills (caused millennia ago by volcanoes), its medieval hamlets and monasteries (many still inhabited by Benedictine monks) and by its unspoiled landscapes (the wine region is part of a “Parco Regionale” and protected land). We have organized this luxurious private day excursion from Padua as an opportunity for you to visit the best wine estates, visit the prettiest villages and enjoy the best of Colli Euganei. 10 a.m. Your private chauffeured Mercedes and elegant English speaking driver will pick you up at your hotel in Padua or the surroundings, and you will head south to the wine hills. The drive is about 40 minutes, so sit back in your comfortable Mercedes and relax. Your first stop today is at a leading small estate, run by a passionate entrepreneur who is also a very talented Cello player. Begin with a tour of the lovely vineyards, and learn all about the grapes grown here from the whites like Tocai, Garganega and Riesling Italico, to the reds such as Raboso and Barbera. In the Colli Euganei they have also cultivated Cabernet Sauvignon and Merlot since the 19th century, and these grapes are widely used. You will taste the range of wines at this boutique estate and carry on to beautiful Arquà Petrarca (considered to be one of the loveliest medieval hamlets- “Borgo”- in Italy). Italians associate this little 14th-century village with the poet Francesco Petrarca, who lived out his last years here (indeed his Venetian marble tomb is here, too). Lunch is waiting for you at a cozy trattoria and you will taste local dishes all paired with Colli Euganei wines. The local pasta dish is “Bigoli with ragù”, a thick homemade spaghetti served with a lusty sauce of beef, tomato, veal, pork, and porcini mushrooms. After lunch, enjoy some free time to explore medieval Arquà Petrarca on your own. Your last stop for today is to a spectacular monastic estate dating back to the 12th century that now features manicured gardens, luxuriously appointed rooms often used for weddings and a whole working organic winery. You will explore the beautiful estate and castle followed by a tasting of wines directly from oak cask and amphora! If we arrange this tour for you at harvest time you will even get the opportunity to participate in the harvest and learn about ancient winemaking methods. Fascinating and memorable. After a tour and tasting, you will head back to Padua where your driver will drop you off at the hotel at approximately 7 p.m. This concludes a fabulous day out in the wine country, we look forward to seeing you again next time! We hope you had a fantastic food and wine experience!